Last week I blogged about Lloyd Alexander, the American fantasist who creatively reshaped elements from Welsh tradition to create an exciting fantasy world and a very successful, award-winning series of books. Alexander’s The Book of Three (1964) is the earliest text explored in my forthcoming monograph, Celtic Myth in Contemporary Children’s Fantasy, due out soon by Palgrave Macmillan. Today, I continue a series of blogs related to my book, with another American fantasist who is on the opposite side of my chronology continuum, having produced the most recent text of Celtic-inspired fantasy I explored. The name is Henry H. Neff and if you haven’t heard it yet, you’d better take a note of it as his reputation is quickly spreading beyond the USA! 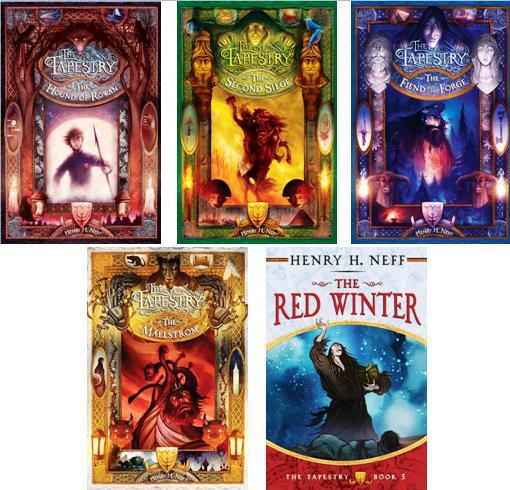 Neff’s The Tapestry series is a worthy addition to children’s/young-adult fantasy and his world-building is truly ambitious and original. The Tapestry series is made up of five books: The Hound of Rowan (2007), The Second Siege (2008), The Fiend and the Forge (2010), The Maelstrom (2012) and The Red Winter (2014). 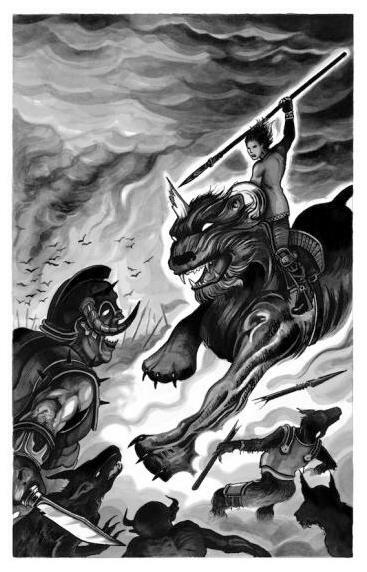 The pentalogy begins in a manner somewhat reminiscent of the style and structure of J.K. Rowling’s Harry Potter series: a young boy suddenly finds out that he is one of a few people around the world who have inherited a ‘spark’ of magic from the ancient powers that once looked after the world. He is then whisked off to a secret school where he takes lessons in a rather eclectic mix of subjects designed to hone his special abilities. But the similarities stop more or less here. Max MacDaniels is only one of two special boys the series focuses on: where Max is unusually powerful and agile, his best friend and roommate, David Menlo, is the most talented “mystic” of his generation. Alongside the two boys we are also introduced to schoolmates, friends, enemies, and teachers (all staple characters of the ‘school story’ genre) but also magical creatures and motifs from myth and legend. In addition to that, already from the first book we have elements of a well-thought-through background cosmogony and cosmology, and from the second book and on the plot expands in space and time to a truly ambitious scope. One of the most successful aspects of The Tapestry is its hybrid status in terms of genre. Although world-building is at the core of the series and fantasy is its main structural and narrative trope, there are also elements of the ‘school story’, science fiction, as well historical fiction. Myth and legend are also main ingredients in the ‘cauldron of story’ that Neff has created, blending a number of different mythological traditions including Irish, Greek and Roman, Egyptian, Hebrew, Finnish and Anglo-Saxon. The result is a rich mythopoeia which, for me, is mainly carried by the centrality of the Irish tradition in the series. While researching my book, it was so very exciting to see a new fantasist from outside Ireland being so powerfully inspired by the life and deeds of Cúchulain, the most celebrated hero of medieval Irish literature. The figure of Cúchulain, the “Irish Achilles”, has been appropriated by different sides of the Irish political spectrum for centuries, often for diametrically opposed ideological causes. His status as a national hero is left aside in The Tapestry. Refreshingly, Henry Neff offers us a vision of Cúchulain as a teenager: just like his Irish inspiration, Max MacDaniels possesses supernatural strength, becomes the defender of his people, struggles with the heroic code and his own identity, and all of that at the threshold of manhood. A number of other figures from Irish medieval literature make an appearance, including Lugh, Scathach, and a Fomorian, while Neff’s cosmology involves the legendary race of the Tuatha de Danaan. More on Neff’s creative engagement with the Irish tradition in Chapter 3 of my book! Henry Neff’s mythopoeia is supported by a creative element that is often seen as ‘para-textual’: Illustrations based on his own drawings. Tolkien famously visualised Middle-earth and provided his own illustrations for The Hobbit, but much of his art remained unpublished in his lifetime. Neff’s five books, on the contrary, engage in a sustained way with the visual side of his world: each chapter opens with a drawing and each volume also contains a handful of full page illustrations. We, therefore, get a very clear sense of how much successful fantasy relies on imagining a rich, alternative world which can be experienced visually. Astaroth, the arch-villain of the series, is not the typical “Dark Lord” we expect from fantasy: he is seductive, relatable and unpredictable. As a reader one is never sure how he will react or behave. The series does humour really well, and includes some memorable characters who may initially seem to be there only for comic relief, but end up showing a great degree of complexity. That Neff’s spin-off series, Impyrium, will be published by HarperCollins (the official publisher of J.R.R. Tolkien and George R.R. Martin) is a clear indicator of Neff’s developing skill and creative vision. Impyrium is out on 6th October, but you can read the first 100 pages as a free sample via the HarperCollins website. I, for one, can’t wait to see what happens next!